It's down to the wire here at home, but I'm determined I'm getting this post done before midnight here in Denver. I'll admit, I started working on it earlier today and was side tracked. And when I say sidetracked, I mean SIDETRACKED. 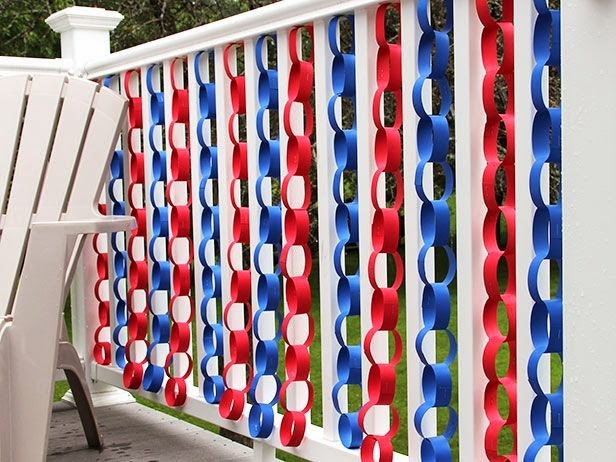 While searching for patriotic themes, I came across some patriotic wedding theme ideas, that stopped me in my tracks. I had to save them for my daughter and that ended up taking a huge chunk out of my afternoon. 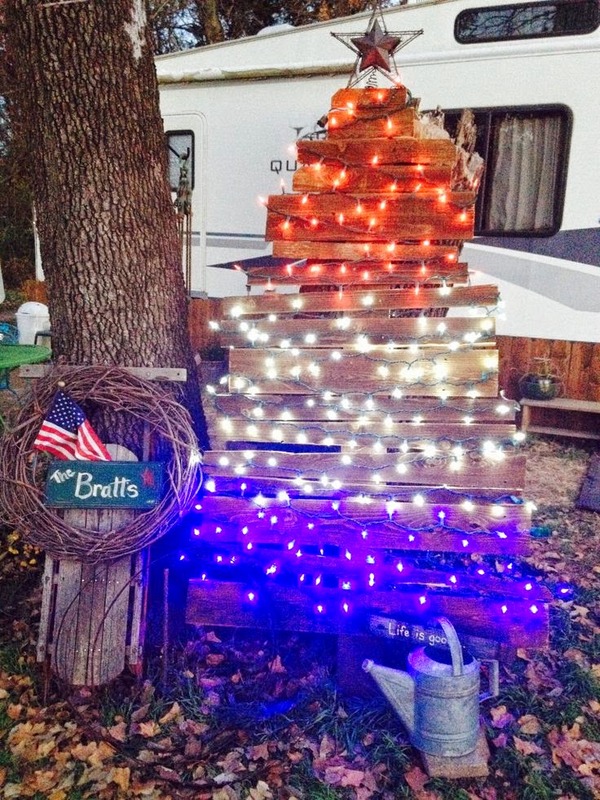 I do plan on sharing those idea boards at a later date, so let's get busy with today's Patriotic Christmas trees. 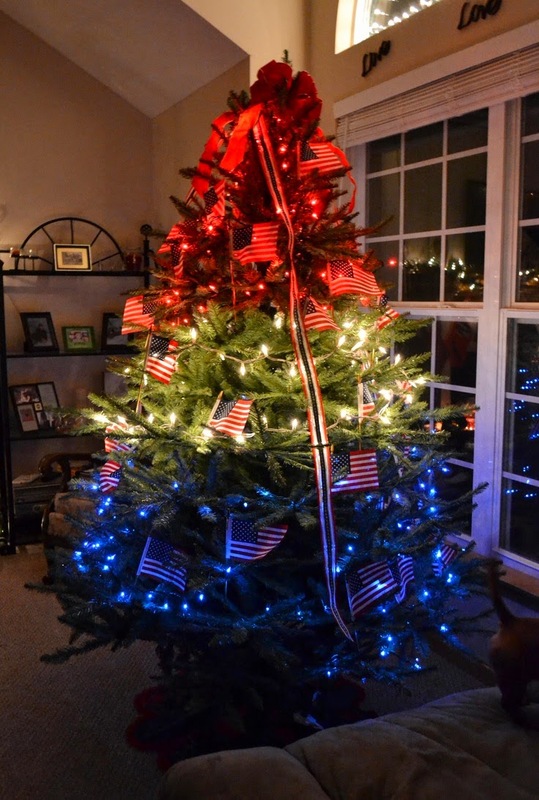 One of my most popular post in the past, was a 4th Of July post about Patriotic Christmas Trees. 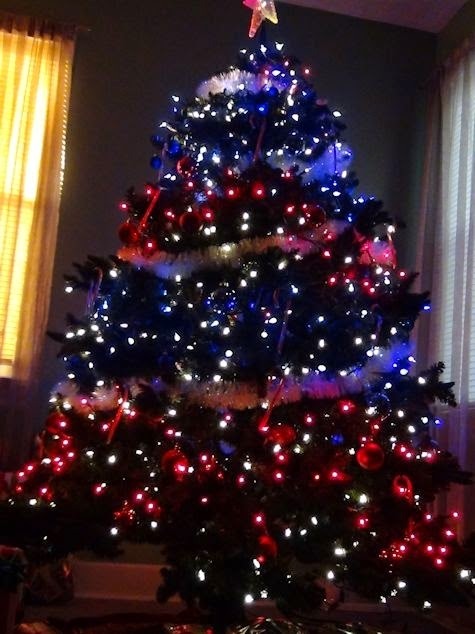 I'll admit, if I could have endless Christmas trees, one of them would be themed in Red, White and Blue, with all kinds of presidential and patriotic themed ornaments. I've seen some beautiful ornaments, but most are super expensive. 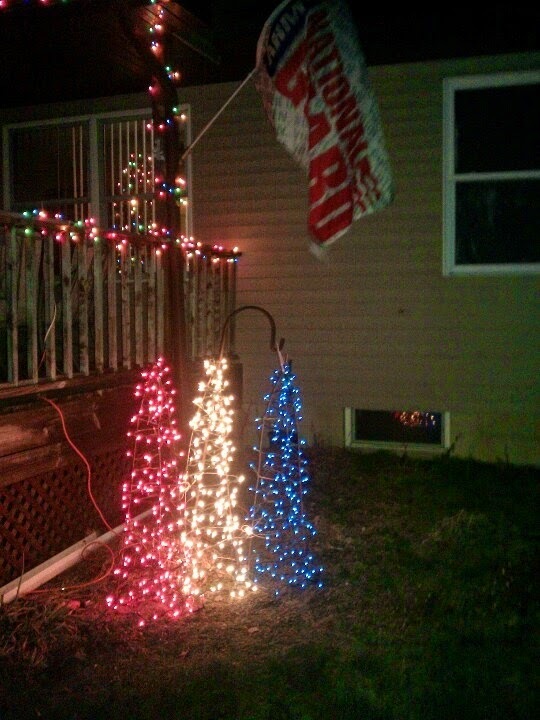 After 9/11 I did put together my attempt at a patriotic tree, however it was on a budget. I used a white tree I already owned, transformed some blue ornaments from Christmas in the past and added some star die cuts from the dollar store. It wasn't as fancy, but it was perfect! 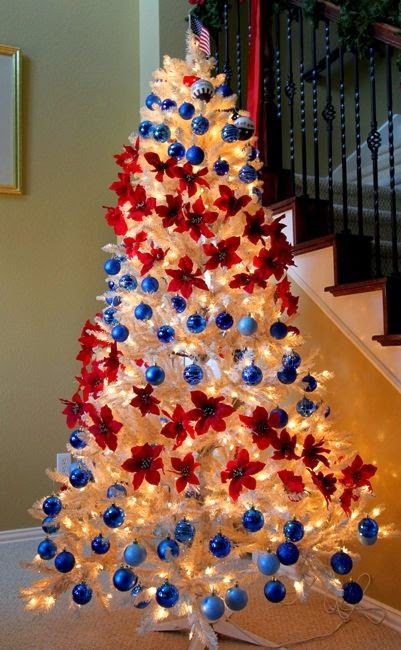 Thinking about that today, got me thinking about how you can put together a patriotic tree on a budget. By just using lights or garland, you can transform a white tree or green tree perfectly. This tree takes it a bit further in details, but limits the decorations to lights, bulbs and poinsettias. Personally I love it! Think small! Little details can often make all the difference. 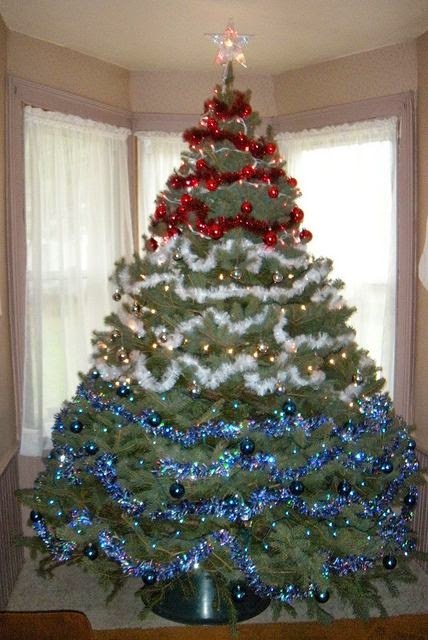 This tree uses curly ribbon in red, white and blue and I think it's fabulous. 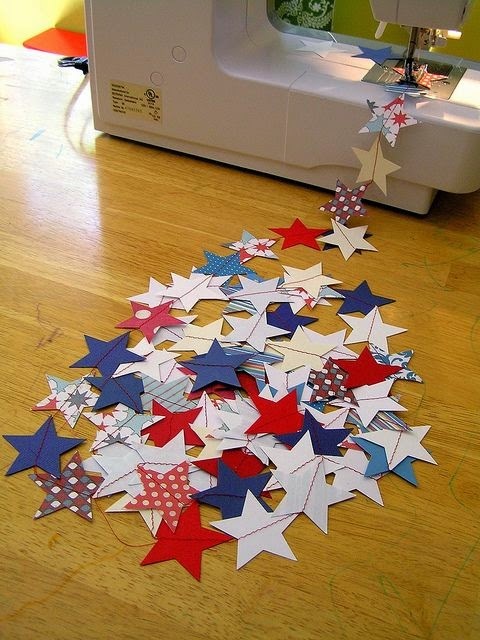 Make your own paper star garland or red, white and blue paper chains. Using lights outside, can be just as simple and effective in making a statement. 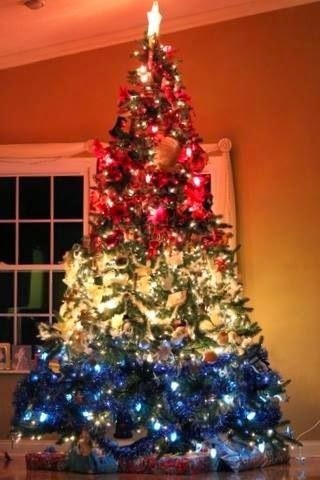 I know not all families choose to have a themed tree and not all families have more then one tree. This holiday junkie just happens to have to many themes to count and probably would have more, if I could. However, switching it up once every few years, can be fun for the entire family. Get the kids involved. Have them make some homemade ornaments. You'll be surprised at how such a simple change can bring some extra sparkle into your holiday. Side note: I do not own these photos. I do apologize for not having more links to original sites. The majority of these pics, took me no when when I tried to link on Pinterest. So if you are the owner of these photos, feel free to notify me and I'll get the information added. 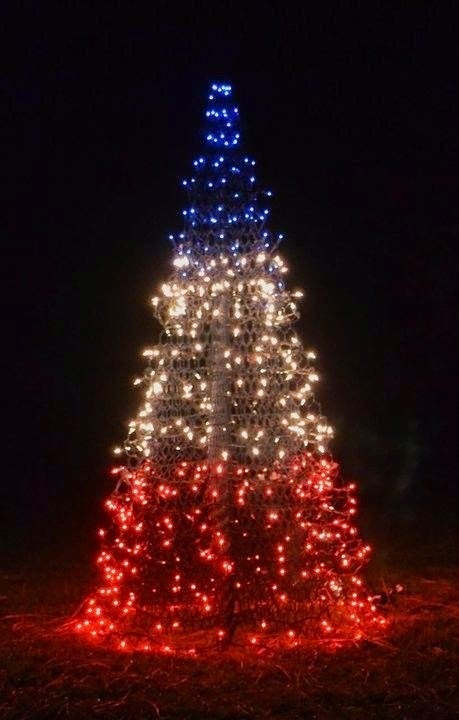 I love the patriotic tree...unfortunately here in Canada only 2 colors.. red and white. I kinda giggle because we had a young couple in our church and when my daughter babysat for them,she came home and told me everything in their house was white and at Christmas time, they only decorated with White and Red, she said it was like being in a Target ad. Your comment totally made me think of that. Lots of people do have Red and White trees, but i would want some other color for sure. A Christmas Story: Everything You Want to Know! Christmas in July Day 5: Gift List?